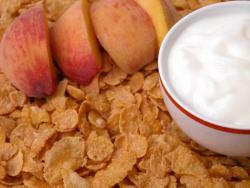 Preschool snacks are essential for a young child's nutritional development and health. With their smaller stomachs, healthy snacking helps kids get the energy and calories they need for growth. Children tend to eat small servings at mealtimes, and it can be difficult for them to obtain the proper amount of vitamins, minerals, and nutrients in three daily squares. Additionally, healthy foods throughout the day help young children to develop healthy metabolism have the necessary energy store for their daily activities. Although factors will vary for individual children, based on activity level, portions eaten at meals, and the child's size, serving preschool children healthy meals and two to three healthy snacks per day are usually appropriate. Allowing children to eat a small meal or snack every two to three hours can keep them from getting overly hungry and cranky. The best times to snack? Typically mid-morning and mid-afternoon snacking is best. Snacking during the day provides calories when activity levels are highest. While "bedtime" or after-dinner snacks are fine on occasion, snacking during the day allows preschoolers to develop better long-term habits. Since metabolism slows as people age, post-dinner snacking habits may contribute to unwanted weight gain as children age. Preschool snacks should be part of an overall daily and weekly food plan, and weekly planning can assist in balancing the food groups. Be sure to choose snacks that are healthful and low-in sugar. Snacks should be served in small portions appropriate for a preschooler and should be varied to provide interest. Food can be a wonderful way for children to express themselves and can often be a vehicle to foster learning, as well. Preschool age children enjoy garnering independence, and allowing them to assist in snack preparation can be a fun way to boost their self-esteem and foster early cooking skills. Organizing food items (i.e. making an English muffin pizza, the child can spoon on the tomato sauce and place the cheese on the muffin). Children can also assist in snack table preparation by passing out napkins, silverware, or cups and cleaning up after themselves when finished. Snacks can also have a role in implementing or reinforcing other learning concepts. Discussing shapes, sizes, textures, colors, consistencies, and tastes in terms of snacks creates interactive learning experiences fort preschoolers. Food can also play a role in particular preschool themes - a unit of farms can include common farm fruits and vegetables. A unit on caterpillars can be culminated with an assortment of fruits, vegetables, and crackers or pretzels to allow the children to create their own edible butterflies. Print our snack activity to use with your kids! 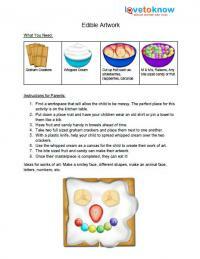 In this activity, your child will create an edible art sculpture by using graham crackers, whipped cream and bite-sized food. This is the perfect activity for little ones to be creative and then be able to eat their works of art. An important note is to have food prepped and ready before the activity. This will ensure that your child will stay focused on the task and not have to wait around for you to get the food prepared. There are a few variations that you can do with this activity. A healthy version of this is to buy fat free or low fat whipped cream and only fresh fruit, raisins and nuts. Another variation is to use honey instead of whipped cream. Whichever way you choose is sure to delight any child. Preschool snacks are important for good nutrition and can be fun, too. There are some considerations that are important to remember, however, for children's safety. Although most preschoolers can chew well, it is still important to prevent choking hazards by making sure hazardous food items are cut into small pieces. Food allergies are also important to remember. Parents should always make sure their child's preschool teacher is aware of any food allergies their child might have, and any adult should consider food allergies and check with a parent or guardian before providing a preschooler a snack.